MAY 11—Although Guy Williamson won the overall men’s division of the 2014 Blenheim Trust 5K Series, Maxford Pipe ended his streak of victories with a furious finish during Saturday’s finale, by .01 seconds. 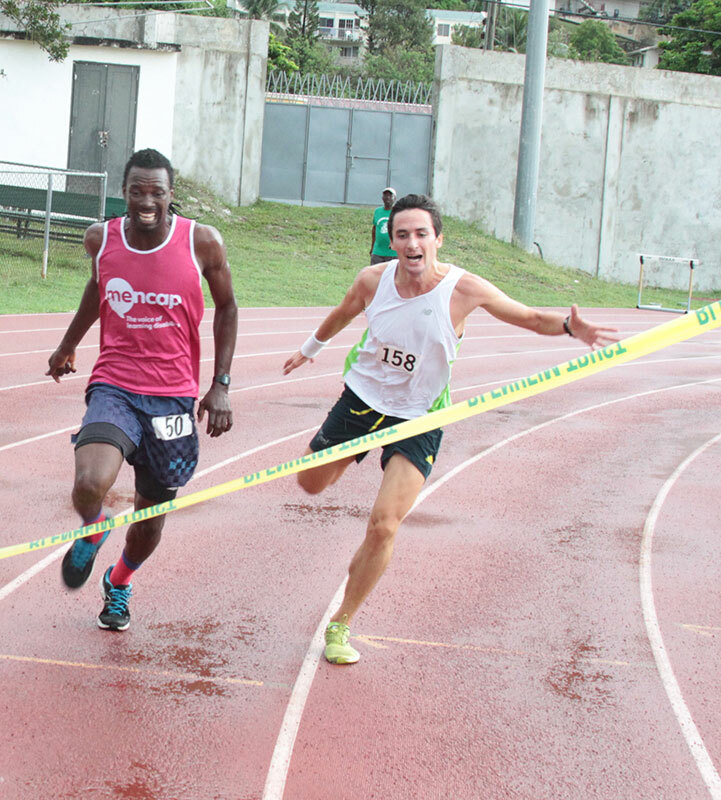 Williamson outsprinted Pipe in the March 8 season opener at the A. O. Shirley Recreation Grounds and this time, Pipe reversed his finishing strategy and turned the tables to win in 18 minutes and 52.17 seconds to Williamson’s 18.52.18. Williamson, who also lost to Pipe for the first time in the Dive BVI 10K Series finale on Virgin Gorda last week, said he has been improving. The race was a pursuit race where the women had a 5 minute start ahead of the men and for the first time ever, no man overhauled the deficit by the first two women, led by Katrina Crumpler’s 22:09 and soon to be 13 year old Tallulah Kinkead’s 23:15. Crumpler, Pipe and Williamson will all contest the 3rd Virgin Gorda Half Marathon on Saturday. The race begins at 6:30 a.m. and will take in several scenic vistas of the island including a section of Gorda Peak and Coppermine. Final Results; Men. 1. Maxford Pipe, 18 minutes 52.17 seconds. 2. Guy Williamson, 18:52.18. 3. Ian Montgomery, 19.47. 4. Julius Farley, 19.16. 5. Curwin Andrews, 20:23. 6. Vaughan Vanoudtshoorn, 20:32. 7. Aaron Gardner,20:40. 8. Michael Killourhy, 21:30. 9. Paul Hubbard, 22:05. 10. Stefano Tasking, 22:21. 11. Adrian Dale, 22:31. 12. Patrick Ormond, 22:36. 13. Charles Kerins, 22:49. 14. Shane Donovan, 23:01. 15. David Kinkead, 23:15. 16. Russell Crumpler, 23:36. 17. Luka Chalwell, 23:58. 18. Dan Mitchell, 24:09. 19. Sam Potgieter, 24:27. 20. Chris Potgieter, 28:01. 21. Carl Masefield, 28:07. 22. Stephen Bridson, 27:08. 23. Chris Ghiorse, 27:28. 24. Henry Creque, 29:46. 25. Howard Moore, 30:01. 26. Stephen Beard, 37:21. 27. Tai Thomas, 43:56. 28. Richard Morgan. Women: 1. Katrina Crumpler, 22:09. 2. Tallulah Kinkead, 23:15. 3. Rosmond Johnson, 23:56. 4. Clare-Louise Whiley, 24:42. 5. Kay Reddy, 25:24. 6. Sally Blackmore, 25:50. 7. Natasha Ruscheinski, 26:22. 8. Anna Kinkead, 26:26. 9. Philomena Robertson, 26:50. 10. Richie Paul, 27:05. 11. Zoe Bickerton, 27:24. 12. Juliane Potgieter, 28:31. 13. Ghislaine Hoogendijk, 28:52. 14. Barbara O’Neal, 28:57. 15. Katy Morley, 29:49. 16.= Amity Hill and Liberty Fletcher, 30:02. 18= Emily Abrehart, 30:19. 18= Jenni Dobie and Clair Burke, 30:30. 21. Li-Ann Yap, 30:34. 22. Pippa Dabbs, 30:42. 23. Roslyn Gilbert, 30:58. 24. Anya Rhoden, 35:53. 25. Jahde Boisgirard, 41:48. 26. Belinda Dabbs, 42:04. Power Walking. Women: Sophie Bennett, 40:07. Men: 1. Gerald Rose, 39:35. 2. Zebalon McLean, 39:39. 3. Robin Tattersall, 53:32. Overall Rankings. Men: 1. Guy Williamson. 2. Maxford Pipe. 3. Ravi Sukhu. Women: 1. NiMade Oniaish. 2. Rosmond Johnson. 3. Claire Louise Whiley.